Please contact us for any B&B accommodation enquiries and check availability for the dates you are interested in, plus guest numbers. - the N11 (route from Dublin city to Wexford and the South East) The M50 merges into the N11 north of Bray. Coming from Dublin or Dun Laoire Ferry Port south along the N11/M11, there are 3 exits for Bray. The third and last one shows Bray South, Greystones, Enniskerry. Exit for Enniskerry at this junction and follow the signs for Enniskerry. This involves crossing over the N11 and back in the direction of Dublin for some 300 metres before exiting to the left for Enniskerry. The village is 2 kilometres from the N11. As you enter the village centre, turn left at the village tower monument. We are within 30 metres of this monument on the left hand side with a sign up in front garden saying "Ferndale B&B". Leaving airport head south towards Dublin. After few kilometres down the road, exit for the M50. 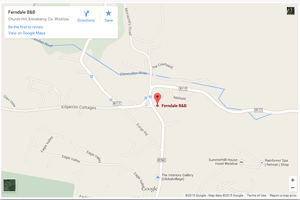 Head south on the M50 and take the directions for Enniskerry as above. 2) From Dun Laoire Ferry Port or Dublin City Centre. Join N11 going south and take directions for Enniskerry as above. 3) From Wexford and the South East via N11 going north. Exit N11 some 300 metres past the first Exit sign for Bray and follow directions from this point in the Directions for Enniskerry as above. Email via the form on our 'Contact' page.